But why did NIRP not find favor with the BoE? After all, by the end of March 2016 as many as six central banks had adopted NIRP in an attempt to counter sluggish growth and deflationary pressures (fig 1). The latest country to join this mad race is the Bank of Japan, which announced in its January 2016 monetary policy statement a negative interest rate of –0.1 percent to current accounts that financial institutions hold at the Bank. To understand the reasons for the BoE’s decision to maintain the status quo we must first know what NIRP is. 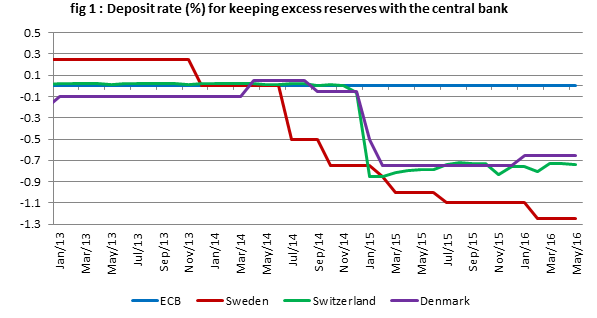 NIRP basically aims at penalizing the commercial banks for holding excess reserve deposits with the central bank. In other words, instead of receiving money on deposits, banks have to pay regularly to keep their money with the central bank. The idea is to incentivize banks to lend more freely to give a boost to dwindling credit growth. This in turn is expected to spur inflation and drive the economy out of recession. It is interesting to recall that the economic theory emphasizes no distinction between positive and negative interest rates as long as all interest rates move in tandem; and only real interest rates and spreads between real interest matter (Agarwal and Kimball 2015). It is also argued that NIRP is entirely “conventional” monetary policy, just like cuts in positive interest rates and intense negative rates in the short run would help trigger economic growth during deep recessions and would hasten the economic recovery process (Kimball 2015; Bernanke 2015). But why did central banks have to venture into the unchartered territory of NIRP? After all, other unconventional policies such as QE were still available. In fact, a host of central banks including the Fed were putting QE into play. The answer lies in the fact that the respective QEs have not been able to produce impressive results and many doubt whether QE is the way forward to achieve the desired inflation level. Remember that after the financial meltdown of 2008, banks had suddenly turned risk-averse and were reluctant to lend credit. To incentivize banks to lend more, the Fed adopted QE in different phases. However, in response, the banks chose to keep the excess reserve money supply either as deposits with the Fed or invested in government securities. As a result, even in response to a quantum leap in reserve money, the money supply never really picked up in the US. 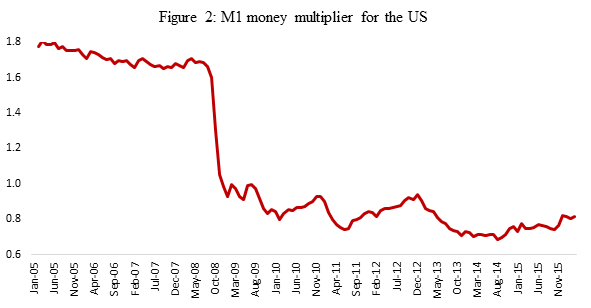 As can be seen in figure 2, the M1 money multiplier plummeted post September 2008. In fact it fell below one, implying that every dollar created by the Fed results in less than a dollar increase of the money supply (M1). Clearly, QE failed to boost credit lending and spur inflation. It was this failure of QE that forced the central banks to look for alternatives and adopt unconventional NIRP. So, in countries where it has been adopted, has NIRP been more successful than QE in fighting deflationary tendencies? 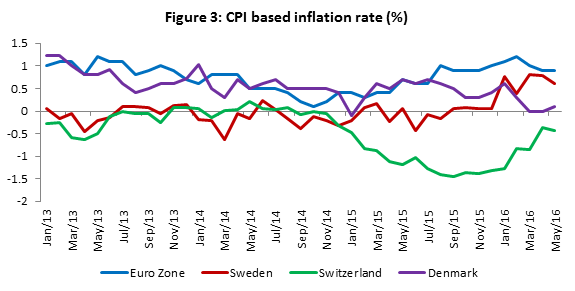 To check this we plot a time series of consumer price index (CPI)-based inflation for the eurozone, Sweden, Switzerland, and Denmark (figure 3). As can be seen, these countries are still struggling to achieve the desired inflation level of 2 percent. In fact, Switzerland—where the penalty imposed on excess reserves is the maximum—has been witnessing negative inflation for more than a year now. Not only has inflation failed to reach the desired level in these countries, bank lending has also failed to pick up (figure 4). 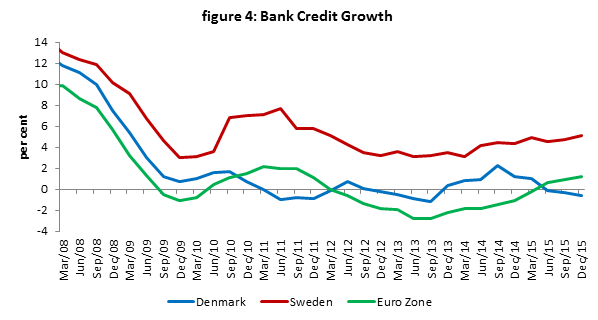 In response to the financial meltdown of 2008, average bank lending growth plummeted and even remained negative for many quarters in Denmark and the eurozone. Bank credit growth continued to remain sluggish even after adoption of NIRP. But why has bank credit growth not picked up post NIRP regime? After all, banks have to pay a penalty if they hold excess reserves. Should the banks not increase their lending to avoid penalties? To answer this, we must look at the channel through which the policy rates are transmitted in the market. Commercial banks must cut their lending and deposit rates for monetary policy to be transmitted to the market. However, commercial banks seem rather reluctant to pass negative interest rates through to retail depositors. Retail deposits still remain the most important source of bank funding. Not only are retail deposits cheaper relative to other sources of funding, they allow banks to afford higher interest spreads. No wonder banks are not cutting their deposit rates, as they fear significant deposit withdrawals. Consequently, to be able to maintain their profitability, the banks are also unwilling to cut down the lending rate much. As shown in figure 5, banks’ net-interest margins have remained more or less the same since the adoption of NIRP. Not only has NIRP failed to achieve its intended objectives, some unintended adverse side effects are becoming evident now. The world passed a historic milestone in May when, according to Fitch, negative yielding government debt rose above $10 trillion for the first time. After Brexit, investors’ flight to “safe assets” accelerated and the global total of sovereign debt with negative yields was a staggering $11.7 trillion as of June 27, 2016. It may have adverse consequences for global growth in the long run. Also, very low interest rates may be building risks into pension funds and other social security plans (Financial Stability Report of RBI, June 2016). Given this unimpressive record, it is not surprising that the BoE decided to pass on NIRP this time. In fact, a sustained sterling slide, which may result in higher inflation owing to increased import costs, only made the decision easier for the BoE. Who knows? The BoE may even consider tightening the monetary policy stance in future to keep inflation in check, as well as to pre-empt capital outflows. Two plausible policy alternatives are available to the BoE: (a) issuing digital currency to the tune of 30 percent of GDP (already highlighted in the recent working paper published by BoE: Barrdear and Kumhof, July 2016), and (b) introducing helicopter money, i.e., a money-financed fiscal program (MFFP), by printing money (Bernanke 2016, Anand and Agarwal 2016, Buiter 2016, Turner 2015). Will the UK go the way of Japan? Agarwal, R. and Kimball, M.S. (2015), ‘Breaking through the zero lower bound’, IMF Working Paper no. 15/224, Washington DC. Anand, A. and Agarwal, S. (2016), “‘Unimaginable’ helicopter money turns into hot topic; here’s why”, Op-ed, Financial Express, June 2016, New Delhi. Barrdear, J. and Kumhof, M. (2016) ”The Macroeconomics of Central Bank Issued Digital Currencies”, Staff Working Paper No. 605, Bank of England, July 2016, UK. Buiter, W. (2014), “The Simple Analytics of Helicopter Money: Why It Works — Always”. Economics: The Open-Access, Open-Assessment E-Journal, 8 (2014-28): 1—38, August 2014. Chakraborty, L. and Samiksha Agarwal (2016): “All about Brexit repercussions; From education, immigration to austerity and more”, Op-ed, Financial Express, June 21, 2016, New Delhi. Kimball, M. (2015): “Negative Interest Rate Policy as Conventional Monetary Policy”, National Institute Economic Review, 234 (1), November 2015. Reserve Bank of India (2016), Financial Stability Report, Reserve Bank of India, June 2016, Mumbai. Turner, A. (2015): “Between Debts and Devil: Money, Credit and Fixing Global Finance”, 2015.